Today I will treat you all to a circle lens review! 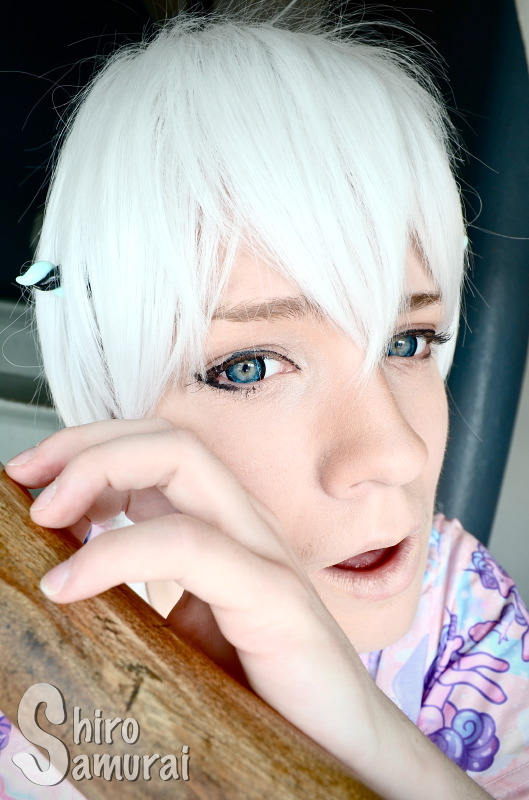 I will be reviewing the super adorable I.Fairy Star Blue lenses! o(･ω･)o These lenses feature a really unique star-shaped design with a thick black limbal ring – perfect for big-eyed cute and magical looks! 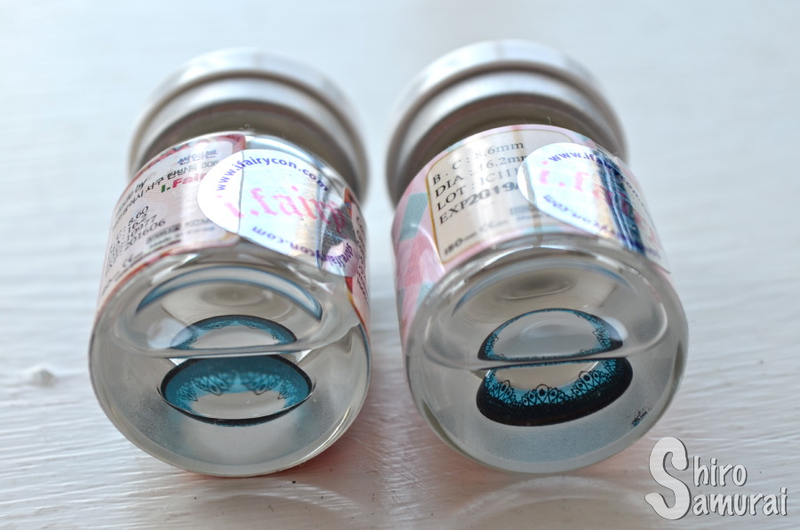 As you can see my lenses came in different I.Fairy vials – but that's really nothing to worry about. It just means that the lenses are from different production batches; it happens every now and then and, especially, if you order lenses with different prescriptions. 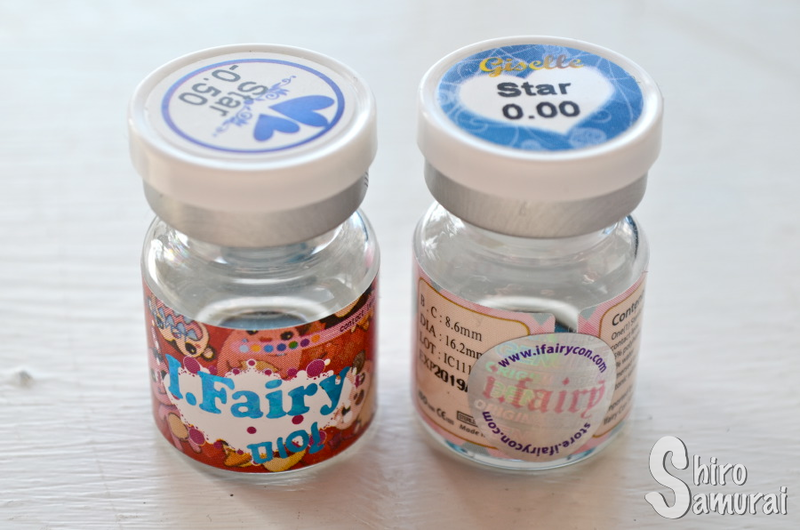 :) As long as you have the I.Fairy authenticity stickers on the vials you can be sure that you've received genuine and safe-to-wear lenses! 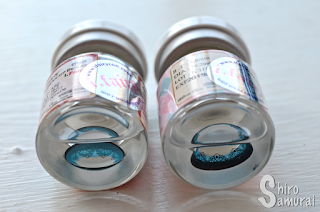 I put the lenses to soak the evening before I had planned on wearing them; you should take them out of the bottles at least 8 hours before wearing because the solution used to store them in the bottles is not the same you use. One lens in. Shows enlargement effect. Upon insertion the lenses felt very slightly irritating for the first minute, but that went away rather quickly. They are comfortable and don't block my vision in any way but, most of the time, I could tell that I was wearing contacts. They seem to dry out fast for me though; the first punches of dryness came already within the 1,5-2 hour range and after 3 hours had passed I really wanted to take them out. Please note though that I've had especially tired and sensitive eyes lately, which might be part of the reason why I couldn't stand these for very long. Another thing is that after taking off the lenses my left eye was really sensitive and stingy for about 30 minutes – it basically felt like there was an eyelash hair in my eye that I couldn't get out. My eye hurt if I put pressure on it, rubbed it or anything like that. Luckily it went away by itself but it was weird since I never experienced anything like it before. I think it might be because the left lens would have expired on June 2016 if I had not opened it. The right lens expired first on 2019 so yeah, might explain why it was only the left one that gave the "afterburn". All photos taken by me during an April afternoon with a semi-clear sky. All close-up photos are free from color filters and such and that's so that the colors would be as true to real life as possible. Outdoors, sitting under the roof/shadows. Facing sun. 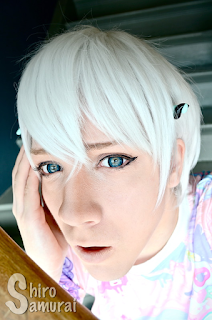 As you can see these lenses are rather big and they have a really prominent thick black limbal ring that gives you a cute dolly and/or animated look. ^.^ The lenses have a really unique star-shaped design and I think it's really cool! I've never come across other lenses with a similar print so I do like it a lot! What makes it even better is that the blue shade is really beautiful and it shows up well and does, in fact, blend rather nicely with my light blue-gray eyes; I didn't expect them to fit in with my eyes as well as they did, considering how vibrant the color is and how artistic and unnatural the design is! 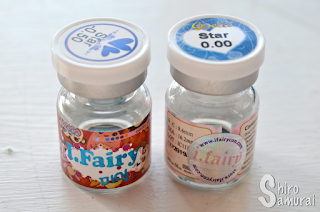 The I.Fairy Star series might be better suited for j-fashion styles like decora, pastel goth, fairy kei and such rather than for cosplay. I don't intend to say that they don't fit cosplay purposes but I think that the design of the lenses complements cute fashion looks better and, I think, that the big pupil hole might not make the lenses jump out as much as needed for cosplay photography – especially when the cosplayer is seen from a distance and the eyes need to grab attention from afar. A big pupil hole means that more of your own eye color shows through in the middle, which I know that some people with naturally light eyes finds doesn't look right and "clashes" with the color of the lens. Personally I'm neutral/indifferent to the look but I do acknowledge that a big pupil hole also means that the lens won't hinder your vision (colored corners when you move gaze etc) and this I really appreciate. Beautiful and vivid blue shade that shows up well and isn't overwhelming. Really pretty and unique star-shaped design with a thick black limbal ring! The colored parts of the lens do have good color coverage. These are big and give you a dolly look! Comfortable for short-time wear but dries out fast for me (3 hours). Left lens burns my eye after I take it out, likely because of it being close to expiring before I opened the bottle it was in. Thanks for reading! If you have any questions just leave them in the comments!